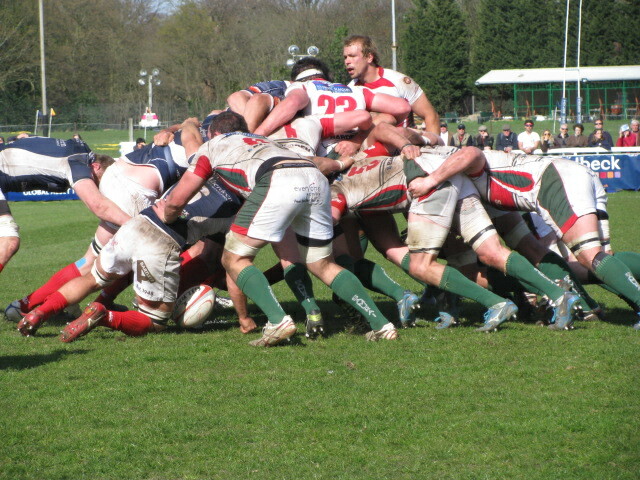 Recently I have started to watch rugby on the telly and a friend of ours who loves the sport invited us to a match. I love new experiences so I jumped at the chance. He was kind enough to answer my questions and he didn’t treat me like an idiot (even though I’m sure I asked some silly questions since I am clueless about the sport). 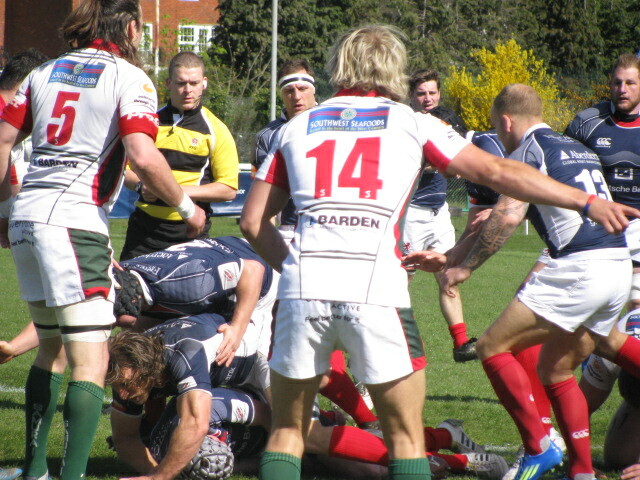 We watched the London Scottish play Plymouth Albion. The home team, the Scottish were not victorious, which was unfortunate since our friend is a huge fan. The season is over, but I have a feeling I might catch a few more games next year. I doubt I will ever actually play rugby, but I admire those who do. This guy greeted the players as they prepared for the match. During the match I marveled over the strength and determination of the players. If you want to play, remember that injuries can happen. 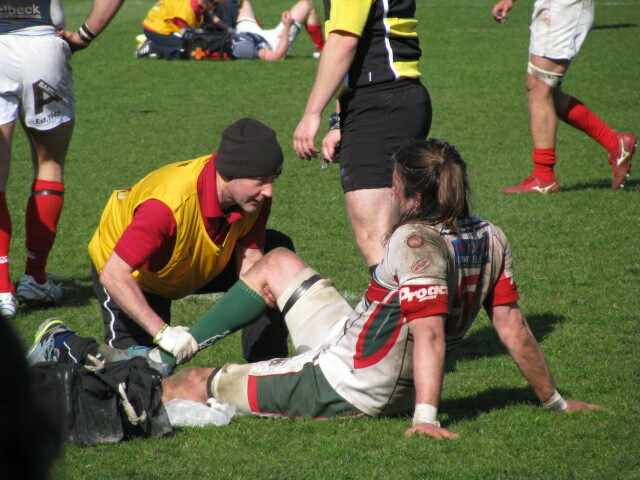 Two players are receiving treatment in this photo. And there were others. After the match many of the players needed some rest. It was a fun afternoon and I really appreciate our friend for inviting us and for helping me learn the ins and outs of the game. I know it will take some time, but I have a firmer grasp on it. All in good time. 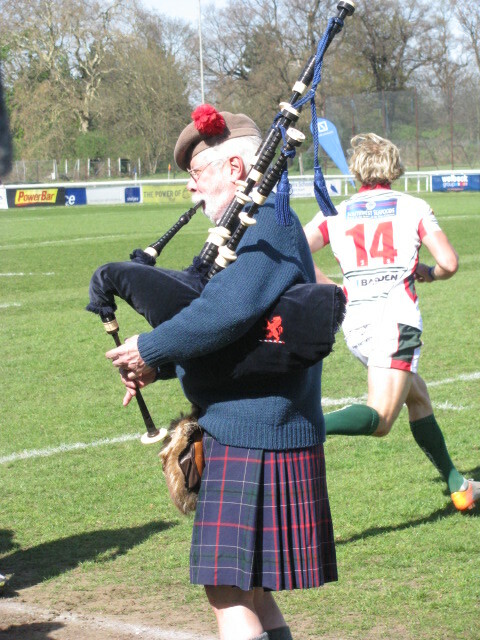 This entry was posted in Sports and tagged England, Life, London, London Scottish, Photography, Photos, Plymouth Albion, Rugby, Spots. Bookmark the permalink. It was enjoyable…and the weather was pleasant. The first game he invited me to I couldn’t make it and it rained and was extremely cold. I was relieved that my calendar was full. Looks like a fun afternoon and you are learning a new sport!!! The bagpipes would probably have been my favorite part of the day. Oh and if there was any food—-yum….can’t watch sport without food! Don’t fret..there was food and beer. I loved the guy who played the bagpipes. He was a character and I’ve always loved to listen to bagpipes. When people enjoy themselves it is hard not to have fun. True, true!!!! Glad there was food….and beer!!! 🙂 What would sport be without? Hey—I like that you added that “uncheck the comment box” —-I might add that to mine! WordPress has been driving me nuts with that change lately when I didn’t catch it and commented on a couple of Freshly Pressed blogs….argh!!!! Oh man I bet that flooded your inbox! I didn’t want to eliminate the notify me completely since some people like to follow all the comments. This seemed like a decent solution…if you have another way please let me know. I know many people are peeved about this change. YES!!!! And they keep coming!!! I just did not notice that the box was all the sudden checked all the time. If you have a WordPress blog it is not really necessary since the responses to your own comments show up in the header and you can view them there. I don’t know if it will be noticed when people comment but I added it to mine, too. It was driving me nuts. And THEN WordPress does a post about it……after I have hundreds of emails……grrrrrr…. I also did the same thing with a freshly pressed blog and must have received 100s of emails – literally. Not kidding! I must also go and uncheck that! Oh no…I went into my global settings and changed it. Good luck! If I understand correctly, if you change it in your global settings then you don’t have to worry about the boxes on other blogs. It will be unchecked on all WP blogs. I KNOW! It was driving me absolutely nuts. As if I didn’t have enough emails to sift through! I fixed it on my subscriptions and added that note to my blog too!!! Whew! I understand that WP wants to try new things to make “improvements” but it would have been nice if they warned us first. I hope your changes help. I’ve noticed a big difference. You aren’t alone. I’m usually out of the loop…most of the time I don’t even know there is a loop. At least you are willing to patiently learn … and then you will discover its beauty that I don’t know. At first I wasn’t into it, but then I started to see the patterns and why they do things the way they do. It will be fun to go to more matches and to expand on my education. This is a method to all the madness in sports, yet it is more subtle than many realize. I don’t know rugby, but a tip of the cap to you for giving it a chance. Thanks! Who knows pretty soon I may be following a team every week. It could happen. It’as one of our national sports in SA and I watch around six or seven games over each weekend in the Super 15. Great game! Wow that is dedication! I’m enjoying getting to know the sport…maybe I’ll reach your level of dedication in the future. I think England is hosting the next World Rugby Cup. If I’m still here that would be fun to attend. To address the concerns of your readers, WP has just introduced a way to globally uncheck the comment boxes in your settings. Instructions here: http://en.blog.wordpress.com/2012/05/15/follow-comments/ (do check out the response to the first comment!!) Once that is done the boxes will remain unchecked on ALL blogs you visit. Yay! That is a shame…can you watch it via the internet? I haven’t tried steaming here since I fear it would be really slow. I haven’t followed the NBA at all this year. I hope you get to watch all of their games. I agree! I feel honored each and every time. Great fun to learn about and watch a different sport. I feel clueless about most sports. Beyond the basics, trying to remember the different rules of the game is confusing. It can be confusing. I used to watch the NFL all of the time and I didn’t know all of the rules. I do miss seeing the games. Sometimes they are on here, but with the time difference I miss them. And I never remember to record them. I’m sure you enjoyed yourself and learned a lot. Not the next step is to get your friends together and play a game. (smile) Love you photos. 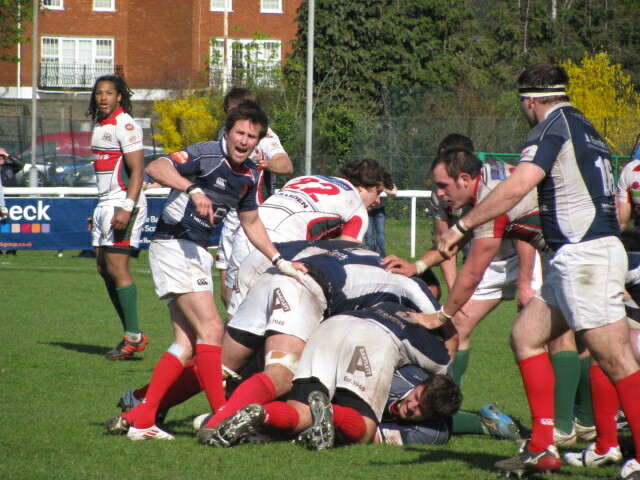 Don’t you just love rugby – I do love watching the strength and determination of those players, ah, deep sigh! The musician was my favorite part. Thanks Nia! Yay, another convert! 🙂 I’m a HUUUUUUUUGE rugby fan (you can ask my daughter! ), so I can appreciate the fact that you had a fun afternoon! Cool!!! I just didn’t have the opportunity to go to many matches in the US. But now I hope to see a lot more. It was a great afternoon! Who do you follow? Well, obviously my favourite teams would be those from South Africa. My #1 team is The Bulls (Super 15), internationally I follow the Springboks, the All Blacks (Nieu Zealand), the Wallabies (Aus.) and then I try and keep up with the Six Nations games. 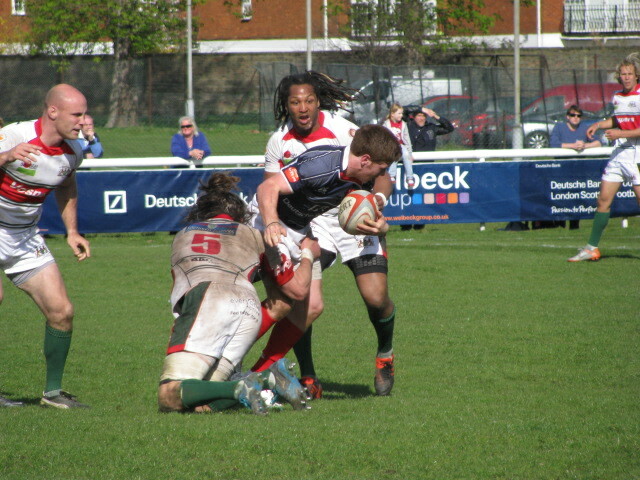 I watched some of the Six Nations recently and that is what got me into the sport. Also, when I first arrived in London the World Cup was going on and I caught a few matches. Great photos! Lots of action, fun to watch. Almost like being there. Thanks! I’m glad you liked them. And thanks for the comment. Thanks for the primer! Now I know something about rugby. I will do my best to share more info. It is a fascinating sport. I have zero clue about rugby too, but your photos have surely piqued my interest. Looks like a pretty physical sport. It is physical, which is why I could never play it. I think you need to learn this sport when you are younger and have no fear.